that help our customers grow. 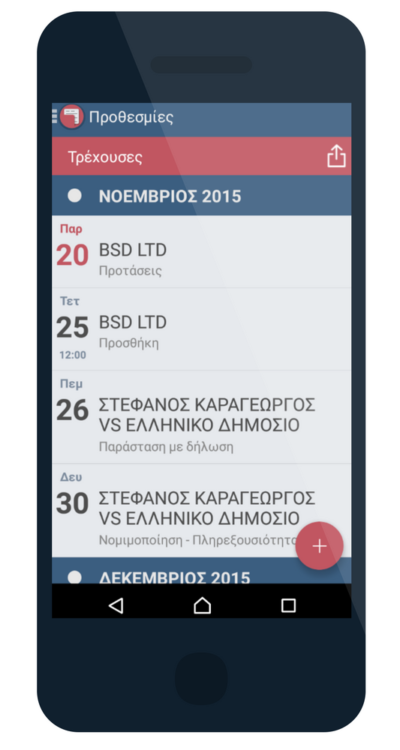 Nobilis is a mobile solution (mobile application) which calculates legal cases deadlines and synchronizes them with mobile or web calendars. Notifications are produced in order to ensure that the lawyer will keep up with all his deadlines. The software is addressed to active lawyers who want to reduce the risk of legal scheduling errors. User’s data is stored in the mobile device and is not shared with any WEB infrastructure. Our network of contributing lawyers ensure the accuracy of deadlines calculation.